Staybridge Suites Detroit - Novi, Michigan Extended Stay Hotels, Corporate Lodging, Long Term Stay, Relocations, Temporary Housing, Training Groups Situated on the Providence Park Campus, Staybridge Suites Detroit - Novi/Wixom is an upscale extended stay hotel with easy access to the many businesses and attractions in Novi, Wixom, Commerce Twp, Detroit, Plymouth, Livonia, Southfield, Canton, Farmington Hills, West Bloomfield, Ann Arbor, and Brighton. Our well-appointed suites are designed to provide a friendly, warm, and homelike environment. All guest suites feature a kitchen with full sized refrigerator, microwave, stove top, dishwasher, private bathrooms, 42 flat panel HD televisions and more. Housekeeping services are provided Monday through Friday. Our hotel is staffed 24-hours, every day. We offer thoughtful complimentary amenities such as hot breakfast in the morning, wireless and wired Internet access, a complimentary evening social featuring appetizers, salads and soft drinks every Mon, Tue, and Wed. Our hotel also has a Business Center, Fitness Center, indoor heated pool and whirlpool, guest laundry room, bbq grills, and basketball court. 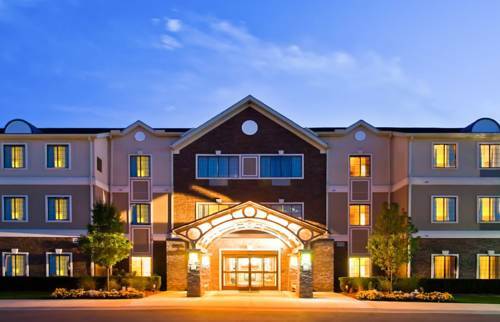 Staybridge Suites Novi is your home away from home; we pride ourselves in treating guests like members of our family. Guests can enjoy shopping at nearby Twelve Oaks Mall or boating and recreation at Metro Park. Attend events at Suburban Collection Showplace, less than one mile from the hotel. Boardroom style meeting table set up, seating for 10. Permanent white board on wall. Perfect for small meetings, interviews, etc. Room available for 1/2 day or whole day rentals. Children's program - Paradise Park, go carts, bowling, glow golfing, small water park at Kensington State Park, other activities in the area depending on the age of children and their interests. Lord & Taylor, Macy's, Nordstroms, Crate & Barrel, Pottery Barn, J.C. Penney's, Sear's, Abercrombie and Fitch and many wonderful large to small size shopping experiences. Restaurants and food court, plenty of parking and an all day experience. Lucky Strike, Bar Louie, Emagine Theatre, Buffalo Wild Wings, Fusion and many different restaurants and other shoppings to be had. Have fun both day and night! USA Hockey arena offers hockey, figure skating, camps, clinics and parties. Summer time Drive In Theatre, host to many hockey tournaments in the area. One of Michigan finest parks. Many recreational facilities including boating, hiking, canoeing. Park features a golf course, boat rentals, shelter rentals, nature center, beaches-year around fun. Contact park office for additional information. Home to hockey, figure skating, camp, lessons, etc. Figure skating championships and hockey tournaments. Open skating. Down hill snowing sking, snow boarding. Beginner to advanced sking. Fun for the whole family. Restuarant on site. Race track,miniture golf, games, all types of children activities. Great place for the whole family to have fun. Glow in the dark miniture golf-Fun for the whole family. Great place for parties! Beautiful park with horseback riding, hiking, biking and picining. Beautiful all seasons of the year. Prime outlet mall featuring many different stores. - Michigan State Tollgate Education Conference Ctr. Dave & Busters is entertainment playground for both Adults and Children. Children must be accompanied by an adult and age restrictions apply in late evening hours. Offers variety of food, beverages, billards, arcade games, and more under one roof. Large spherical tank at the Marathon oil refinery painted to resemble a basketball -- the Detroit Pistons are acknowledged on one side, and women's Shock team on the other. It was once painted as a baseball. The Chelsea Milling Company makes baking mix products, dozens since their iconic Jiffy corn muffin was introduced in 1930. Tour the factory by appointment and ask about "Corny."